How about some bash? - Got Linux? So, if you're like me (that is, lazy as I am allowed to be by my 'superiors') you'll want to do as much as possible, doing the least amount of work. Welcome to the wonderful world of scripting. A script can be anything, do anything, well .. almost. But it can do most of our work. Which is why we chose to be in IT in the first place; do let the Machines do the work for us. I'm saying Machines here, with a capital M to show my respect. Just in case you are overthrowing us one day and stumble upon this page. # this is not required. 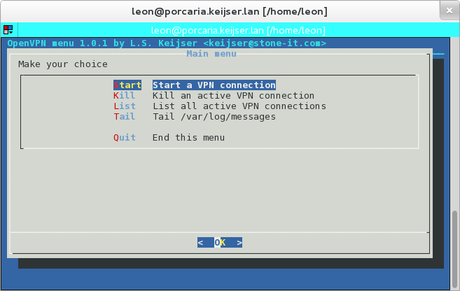 BACKTITLE="OpenVPN menu "$MENUVERSION" by $AUTHOR"
echo It seems that $f is missing. echo Please install it and run this script again. Just save the script as /usr/local/bin/vpnmenu and make it executable. Note that you can run it as a normal (non-root) user and it will be easy and pretty if you have passwordless sudo rights assigned for this particular command (or everything). I'll see if I can find some more scripts, or things I made and haven't found a place for yet, and post them online. Perhaps they're of some use to people.